Japanese and Germans are known for producing high-quality products. 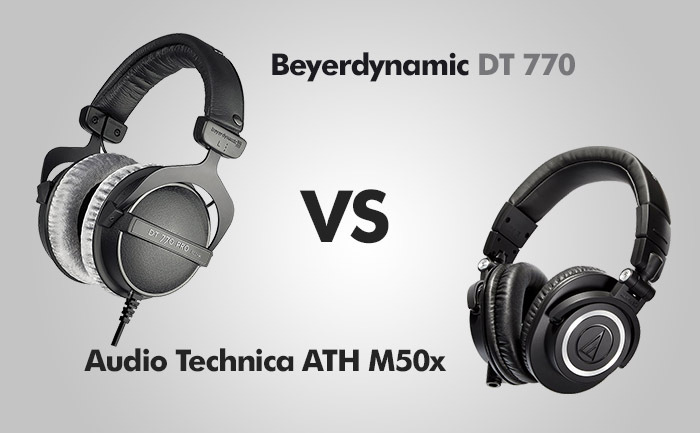 In this review, I would like to put this claim to the test, by reviewing two pairs of headphones: one from Audio-Technica and the other from Beyerdynamic. Let’s check if these headphones are good for an average consumer or maybe they are better for more advanced users who need a pair for music tracking and music mixing? Because both pairs of headphones offer over-ear design, they are quite big. When you hold them in your hands, you will notice that there is not much of metal there. There is a little ring of metal around the ear cups, and the headband is reinforced with steel. The headphones are mainly made of high-quality plastic. Still, they look pretty good. The headband and earcups don’t stick out much, so you won’t look funny taking them on a trip. The padding on the earcups and heading is very comfortable, even for extended periods of time. When you expand and collapse the headphones you won’t hear any squeaks, they feel solid and sturdy. And the experience is consistent each time you use them. It comes with a 10 feet (3 m) long 6.3 mm twist-and-lock mechanism to keep the cable in place, so it won’t eject by accident. Additionally, it comes with an adapter from 6.3 mm to 3.5 mm, if you want to connect them to mobile devices. Beyerdynamic headphones are made to last. The headband and ear cup forks are made of metal, and each cup is made of hard, durable plastic and soft plush. They feel heavy-duty and sturdy rather than thin and creaky. Similarly to M50X, these headphones offer closed design. With this type of headphones, you have to remember that they can make your ears pretty steamy, especially on warmer days. They come with a 10 feet (3 m) cable, which is a bit too long for mobile use. It’s attached to the bottom of the left earcup. The attachment point is well reinforced, so there is no fear that it can break easily. Unfortunately, the cable is not detachable, and that means these headphones are less portable than the competition. Closed headphones offer better sound isolation than open ones. Audio-Technica isolate a big amount of outside noise and you can also keep the music for yourself, without annoying other people around you. The bass in this headphones is not overpowering, at least not to the level that it will become dangerous to your ears. Both highs and lows are artificially enhanced, but not too much. It’s good for a standard use, but they don’t sound ‘flat‘ enough to be used as monitors. DT 770 offer closed design. This type of headphones offers some passive isolation. Remember that it’s only passive, so if you want to use them outside there are better models, such as QuietComfort 35. There are a few versions of the DT 770 headphones: 32, 80 and 250 Ohms. If you want to use them with a smartphone, choose 32 Ohms. For 250 Ohm version, you need an amplifier, because smartphones don’t provide enough energy to power them. With the 80 Ohm version, an amp is not absolutely necessary, but you may need one if your phone can’t deliver enough energy, and the experience can be poor otherwise. The bass in these headphones is strong and slightly accentuated, but only by a tasteful amount. Treble is very crisp, but not fatiguing. Highs and mids are clear and well balanced, especially if you play some classic rock. They offer much better instrument separation and soundstage than M50X, making them sound more spacious and 3-dimensional than the competitor. PROS: Detachable cables / foldable / good noise isolation / comfortable / attached adapter. PROS: Comfortable / great soundstage and instrument separation / good sound / attached adapter. CONS: The detachable cable is proprietary, so if you want to replace one of the cords, you need to get it from Audio-Technica. CONS: You need a headphone amp to get the most of these headphones / Not very portable. If you want to use your headphones at home then I recommend buying an amplifier and DT 700, if you prefer to have portable headphones, choose M50X. They have a detachable cable and are easily foldable. But if you want truly portable headphones, go with QuietComfort.